December 5, 2013. Honeybee Robotics has completed development and testing of on a new space dirt and regolith sampling system, PlanetVac. With support from the international space exploration non-profit The Planetary Society, Honeybee was able to build the functional prototype and test it in Mars conditions in on-site vacuum chamber. The functional prototype under development is designed to enable rapid and reliable sample acquisition for in-situ analysis on a spacecraft or for a sample return mission. This type of technology is becoming increasingly important as Rovers are sent to explore other planets. 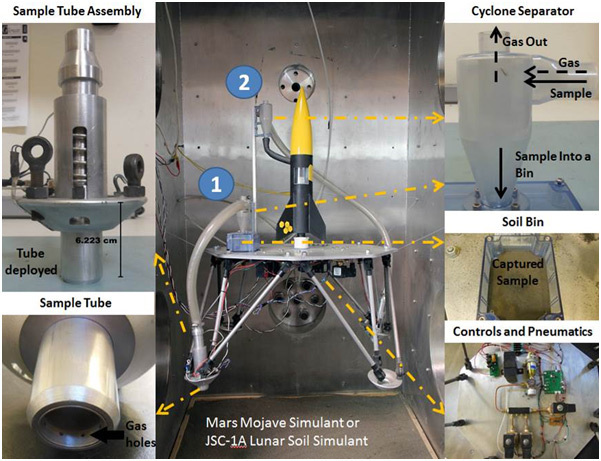 The PlanetVac system is designed for use on Mars, the Moon, or asteroids, as a low-cost and more reliable alternative to traditional sampling systems. Honeybee developed the initial concept in 2002, but has only now built it with the help of The Planetary Society. The Planetary Society and its worldwide members rallied to support the innovative project with a $30,000 development grant. You can read about the final testing in a blog post from Bruce Betts of The Planetary Society.